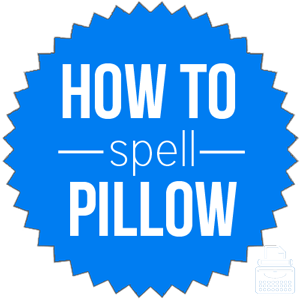 Spelling of pillow: pillow is spelled p-i-l-l-o-w. Pillow is always spelled with two L’s, even in its verb and adjective forms. Definition of pillow: A pillow is a cloth case stuffed with something soft, such as down, feathers, or foam rubber, used to cushion a part of the body, especially the head during sleep. Pronunciation of pillow: pillow is pronounced pih-lo. What does pillow mean? In most everyday cases of the word, pillow is used as a noun. A pillow is a cloth bag stuffed with foam, feathers, or other soft materials that people use to aid them while sleeping. I prefer firm pillow to soft pillows. My bed has many throw pillows that are only used for decoration. Pillow can also be used as a verb where it means serve as a pillow for. The soft, thick grass pillowed my head in the park. Pillow as a verb is comparatively infrequent to pillow as a noun. There are a few common terms and phrases that contain the word pillow. Pillow Fight: A mock fight in which people hit each other with pillows. Pillow Talk: Intimate conversation in bed. Cry Into Your Pillow: Literal meaning; implies someone who is acting childish. Go cry into your pillow or stop being a baby. Cry Pillow: A cry pillow is someone to which someone else unloads his or her emotional baggage. This is related to cry into your pillow. I couldn’t get him to go away. He was treating me like his cry pillow. Pillow came from Middle English: pilwe. Merriam-Webster puts its first use in English at sometime before the 12th century. The Middle English word pilwe came from the Old English words pyle, pylu, pylw-, which are related to the Dutch peluw and the West Germanic pulwī, which ultimately came from the Latin word pulvīnus, meaning cushion. Since pillow is a specific item, it doesn’t have as many synonyms as other words. Pillow is usually used as a noun but can also function as a verb.